It's 2008 and we're having this conversation now? Why are we making this statement at this moment - putting black models on the cover of Italian Vogue? Usually change comes from the outside and inspires fashions, it take a lot for the fashion community to band together and create change from inside. Perhaps it's because fashion has become so much more omnipresent, affecting people who don't usually pay attention. Maybe it's a good time to make a statement... it's just too bad the industry took this long to make a statement. Also, doesn't Tyra look beautiful? I feel like the stylist on America's Next Top Model trannify her so much that it's become really refreshing to see her like this. It is fabulous that the July issue is the all black issue, black models need just as much coverage as everyone else! Although Vogue is not the major arbiter of equality, but at least it is a step in the right direction. 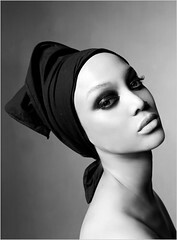 And yes Tyra does look beautiful! I’m currently working with Toyota and I’m really hyped when it comes to spreading the word about the new interactive If Looks Could Kill webisodes. They follow an aspiring fashion assistant who is a prime example of a woman whos’ got it going on. I’m talking the dream job, man who’s got all the ladies drooling, and the spice to keep it all together. Think James Bond meets Sanaa Lathan in Something New. You’ll have to see what I’m talking about. I can’t wait to read your thoughts on the first episode so we can chit-chat abut what’s really going on. Don’t be surprised when you find yourself being reeled in like bait. That will make two of us! I hope I didn’t overstep my bounds by directly contacting you. After viewing your blog and seeing how hip to the game you are when it comes to what’s hot and current, I figured this would be something that would catch your interest.